After you've bought and installed your fire extinguishers, to stay current with the Fire Extinguisher Maintenance Regulations from the HSE it's vitally important to maintain your fire extinguishers on a yearly basis. What is the point of having a fire extinguisher that doesn't work when you want it. You may as well have no fire extinguishers at all, as if they don't work it just wastes time for people who could be escaping the fire, and it's wasted your investment. So, if you've spent a large amount of money on fire safety equipment there's every reason to ensure that your fire extinguishers are inspected up to date, and properly certified. ETC Fire experts will check your fire safety equipment for you and there's no obligation to be locked into any kind of contract. Compliance with Fire Extinguisher Maintenance Regulations - Is Vital. You could even be sued if anyone dies or is injured as a result of having faulty fire extinguishers and they are proved to be the cause of accident or injury. Or if you are inspected, you could receive a fine if your fire extinguishers have not been maintained. 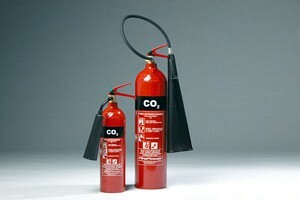 It may seem like wasted money, but if there's a fire, you could easily get caught out by faulty out of date fire extinguishers with unpleasant implications for you, and your business's reputation, not to mention any hapless victims of the fire who will definitely be after you for compensation. CONTACT US now if you think you may be overdue for a fire safety inspection. However, a regular maintenance contract gives total peace of mind and means you don't have to worry about compliance with the HSE regulations. 365 days come around very quickly when you're running a business and before you know it, the year is up. The knowledge that a qualified and experienced Fire Extinguisher Maintenance Expert will call at your premises to ensure that you are compliant at the right time, is a real bonus for you and ensures that your company is always within the law, and you are keeping your employees' safety well covered. Regular fire extinguisher inspections are recommended once a year on average. However this can vary with different kinds of extinguisher. Don't leave it to guesswork, the friendly team from ETC Fire are here to help you. When it comes to public buildings, it's all in the good cause of public safety and so obeying fire extinguisher maintenance regulations is obviously a top priority once you've bought these expensive articles. We can instruct your staff, service your equipment and ensure that you are fire safety compliant whether your company is a small one or with hundreds of staff. Please see our Testimonials page for an idea of the type of people we have worked and are still providing with a much needed reliable fire safety service in Sussex, Surrey and Kent - all around the south east UK. We can arrange to carry out training at hours that suit your staff schedules, even at the weekend or at night. We also provide a number of other services to ensure that you and your company premises, and your employees, feel confident in case of fire. With regular fire training, your staff will be safe and know how to prevent fires from starting and how to escape from a fire should it occur. Your staff can practice with fire extinguishers and will receive plenty of information about each type of extinguisher and where it should be used, minimising the risks of using the wrong extinguisher which could prove even more dangerous than not using one! So Diarise meeting the Fire Extinguisher Maintenance Regulations with our team. Call on ETC Fire for all the support and advice you need on fire regulations. If you think this is an extra expense you don't need, just imagine how much a fire would cost if it started burning your premises and stock. Stopping a fire from starting could just be the best investment you ever made.